Having a potato salad on the dinner table is quite a usual thing. It’s a great side dish because it can fit well with almost anything and you can serve it at a party, a barbecue, a family celebration – whatever you may think of. It’s easy to whip up in a flash, and anyone can make it so it is a great extra to throw onto the dinner table and most people will like it. 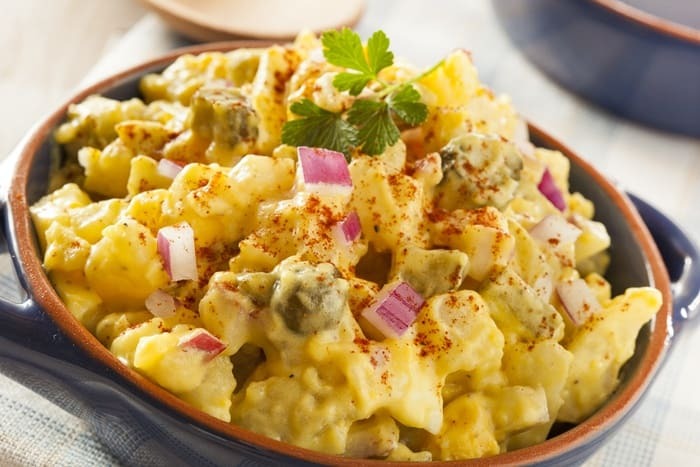 There are a lot of different recipes for potato salad, but the cornerstone ingredient in most of them is mayonnaise – lots and lots of mayonnaise. Without it, is it even real potato salad? Some people would say that it isn’t. Still, there are people who simply can’t stomach mayo, whether because of health concerns or various other reasons. In that case, what can you do? You can’t make a potato salad without mayo – or can you? Well, yes you can, and it can be almost the same as it is with mayo. Don’t believe us? Well, here are some science & recipes that will prove our point. Why Make A Potato Salad Without Mayo? One of the main reasons for making a potato salad without mayonnaise is if you’re a vegan. As you know, mayonnaise is mostly made from chicken eggs, making it completely incompatible with a vegan diet. 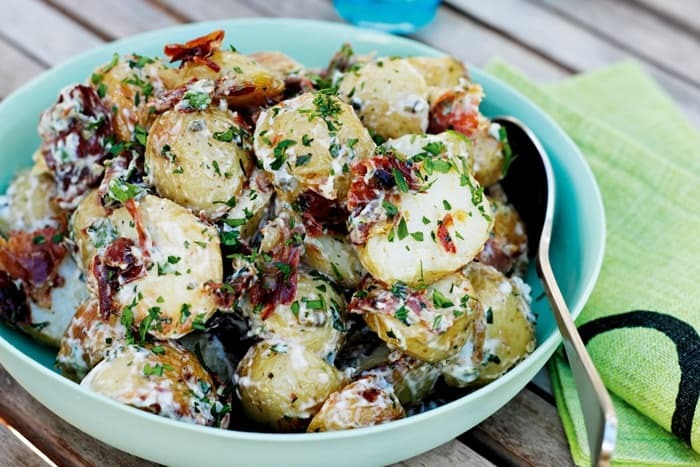 However, you might still want to enjoy a creamy and delicious potato salad regardless, so this is a nice solution. Another reason comes in the form of health concerns. Mayonnaise contains a lot of calories and a lot of bad fats so it can be bad for your health, especially if you have high cholesterol or high blood pressure. In that case, you should avoid mayo due to how unhealthy it can be, but a nice potato salad without mayo might still find its way onto your menu. If you’re trying to lose weight, eating something with copious amounts of mayo in it also might not be a great idea, due to the number of calories it contains. In that case, you can still have potato salad just without the ingredient that makes it so fattening. The last reason is if you simply don’t like mayo and don’t want to be anywhere close to it. That is understandable; there are people who don’t like certain foods and just can’t stand them but might still want to experience dishes that contain them. Making a potato salad without the mayonnaise is a great alternative for those sorts of people. You will find a surprising amount of different potato salad recipes out there, and a lot of them contain no mayo at all. However, some of them aren’t quite up to snuff and are just normal recipes with the mayo removed – that doesn’t make for a satisfying potato salad. Here are some recipes that don’t contain mayo but are equally as delicious as the ones that do. This is a nice alternative to a mayo-based potato salad which is easy to make and has a unique flavor. It is great for people on a diet and is exceptionally healthy and tasty – it has everything you would want out of a dish like this. The ingredients you will need are as follows: 2 pounds of diced potatoes, 2 minced celery stalks, 4 tablespoons of virgin olive oil, 3 tablespoons of plain Greek yogurt, 2 tablespoons of lemon juice, 1 tablespoon of minced mint and some salt and pepper. 1. Preheat the oven to somewhere around 400 degrees. 2. Toss the diced potatoes in a bowl along with 2 tablespoons of oil and some salt and pepper, before placing them on a baking sheet. 3. Roast them for 30 to 40 minutes at most, flipping them over halfway through, when they become tender. 4. Remove them and let them cool for a while in a bowl, before adding the minced celery. 5. While they’re cooling, whisk together the remaining oil, lemon juice, yogurt and some salt and pepper. Taste it a bit to see if you need more or less of some ingredients. 6. After you’re done with that, pour it over the potatoes and toss them to get the completely coated in it. 7. Garnish them with some minced mint and serve to 4 or 5 people at most. As you can see, this is a recipe that can be done in under an hour and requires almost no effort at all. It’s great for everyone, even people who prefer their potato salads with mayo and it has a nice lemony flavor that sticks out when combined with the mint dressing. This is a nice and hot potato salad that doesn’t require a lot of ingredients or complicated preparation. In its regular form, it’s not vegetarian-friendly, but it can easily be modified if needed. Here’s all the stuff you’ll need: 4 pounds of red potatoes, 1 pound of bacon, 1 large yellow onion, 1 cup of white vinegar, 3 tablespoons of German mustard, 2 tablespoons of sugar, ½ cup of chopped parsley and some black pepper. 1. You should start by cooking the potatoes on high heat in a saucepan until the water reaches boiling point. 2. Season them with some salt and reduce the heat to medium. Continue cooking for another 10 minutes or so, until they are tender. 3. Drain the water and leave them to cool for around 10 to 15 minutes. Cut them into large pieces, and then return them to the pan to keep them warm. 4. Cook the sliced bacon in a skillet over medium heat for about 5 minutes, until it becomes browned. 5. Once it’s done, transfer to a plate, but keep the skillet over the heat. 6. Add the onion to the skillet and cook for around 3 to 5 minutes in the bacon grease until it becomes transparent but not browned. 7. Stir in one cup of water, mustard, sugar and white vinegar and keep cooking for another 5 to 7 minutes. 8. Add the potatoes back to the pan and toss them until they are completely coated in the dressing. 9. Add the parsley and the bacon. 10. Season it with salt, pepper and other spices you might favor. 11. Serve it while still warm. There you go! Now you have a tasty potato salad that is easy to make and has a lot of texture. It is high in fat and not suitable for vegetarians, but that is solved by removing the bacon from the recipe and substituting it with something else. Imitation meat or tofu does the job equally well. 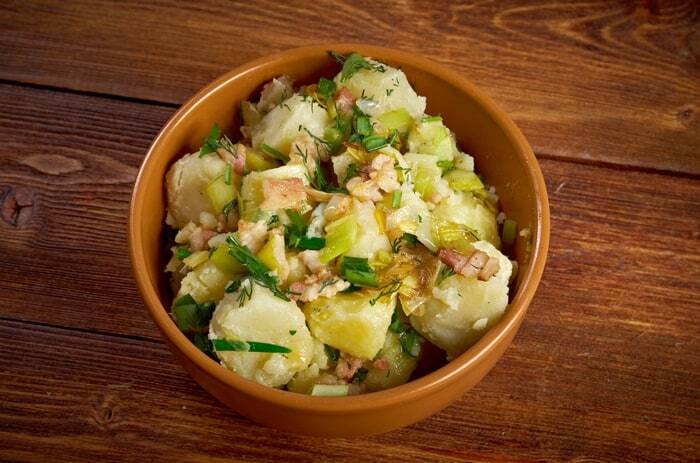 This potato salad is a great side dish that can be served with almost anything. However, it is also hearty enough that it could be a full meal on its own. It’s well-suited for those on a vegetarian diet, and it’s filling while also feeling quite light and easy to eat. 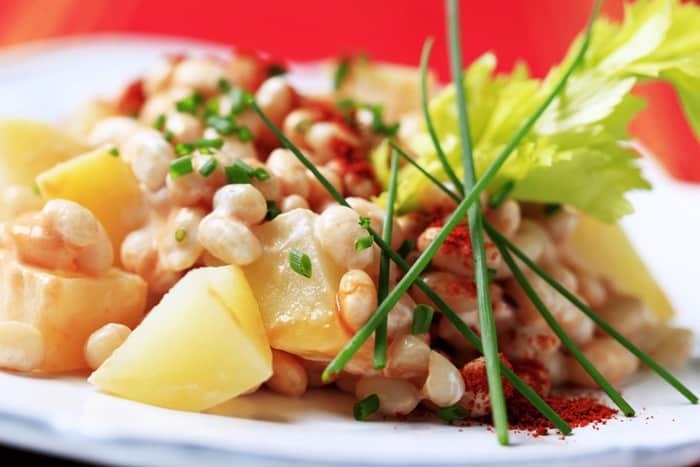 For this dish you will need the following: 4 pounds of gold baby potatoes, 3 cloves of garlic, 2 tablespoons of melted butter, ¼ teaspoon of salt, 1 cup of water, ¼ cup of Greek yogurt, 2 tablespoons of olive oil, 1 tablespoon of lemon juice, 1 teaspoon of lemon zest, ¼ cup of minced parsley, ¼ cup of minced scallions, ¼ teaspoon of black pepper and 1 cup of cannellini beans. 1. Cut the potatoes in half and place them in a skillet, cut side down. 2. Add in water, garlic cloves, butter, and salt. 3. Simmer it all over medium heat for around 10 to 15 minutes, until the potatoes become tender. 4. Remove the garlic, turn the heat up to high or medium-high and cook, while swirling the pan constantly to prevent sticking. 5. Cook for around 15 minutes until the potatoes are golden on the cut side, then transfer them to a bowl. 6. Mash the cooked garlic into a paste and add the yogurt, olive oil, lemon juice, zest and minced parsley to it. Also, add salt and pepper to your liking. Stir it all until it is combined. 7. Add the beans and scallions to the potatoes. Mix it all with the garlic dressing until it is well combined. 8. Season with any additional spices you may like and serve. As you can see, this salad can be quite a decent meal on its own, and you can make it for lunch or dinner if you like since it is quite light. Despite that, it will make you feel full and satisfied while tasting great and spicy. You can modify it to your liking by adding some additional spices or replacing some of the ingredients in the dressing – be creative. There you have it; those are the best potato salad recipes – sans mayo – that we could find right now. Each one is great in a different way and will be able to satisfy most people, even those who like their potato salads with tons of mayo. Each of the recipes is also quite easy to modify to your liking, so you can experiment and create something you might like even more. If you do have a favorite recipe for a mayo-less potato salad, feel free to share it in the comments. We hope you liked this article and that you will read some of our other articles as well. Have a good day and good luck cooking!